One of the most difficult transitions when starting the keto diet isn’t saying goodbye to bagels, cereal, or avocado toast. It’s not walking past the bakery without a second glance (a sugar crash? Who would miss that?). It’s not even getting used to ordering your burger without a bun at your favorite sandwich joint. All of the above, you took in stride. A lifestyle without a sugar rush (and the inevitable carb cravings that come with it) is one you embraced with open arms. What you do struggle with, on the other hand, is time. Suddenly, you find yourself meal prepping more than ever before. You avoid take-out menus, as you don’t know where unnecessary sugars could be hiding. Your waistline is thanking you, but your wrist watch is not. If you really want to stick to a low-carb lifestyle, you have to find a way to make it just that: a lifestyle. You need this diet to work for your hectic schedule — otherwise, it simply won’t be sustainable. Each week, set aside one afternoon to chop vegetables, portion out individual cuts of meat, and hard boil a few eggs. You do not need to prepare entire meals to save yourself a few precious minutes. Make an entire pound of taco meat, then store in the fridge to be used in salads and wraps. Chop up individual vegetables that you can toss by the handful into a skillet with coconut aminos and grilled chicken breasts for a quick stir-fry. You can even meal prep a few low-carb snacks, such as celery stalks stuffed with peanut butter, hard boiled eggs, and sliced bell peppers with guacamole. Frozen items can be your saving grace when you don’t have time to go grocery shopping. Be sure to keep frozen items on hand at all times, for those evenings where you open your fridge only to find that absolutely nothing is in it. Frozen shrimp, frozen mixed frozen vegetables, and a bag of frozen cauliflower rice is all you need to toss together a quick stir-fry on a busy weeknight. If you work a hectic day job, a slow cooker or Crock-Pot can be the most handy tool on your kitchen counter. Simply combine meat, vegetables, and gut-healing bone broth into your slow cooker, set to low for eight hours, and come home to find a nutrient-dense, low-carb soup ready and waiting in your kitchen. For an added dose of healthy fats, consider combining chicken or beef broth with coconut cream or grass-fed, full-fat heavy cream, making yourself a low-carb, keto-friendly chowder. 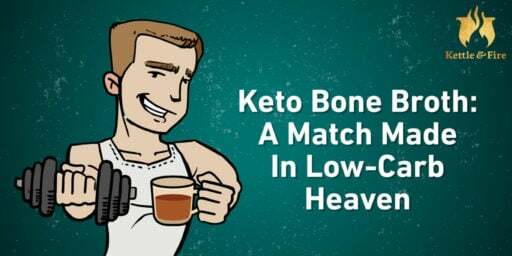 Sometimes, we can go down a deep, dark internet path Googling “keto recipes” without realizing that many of our favorite dinner recipes are already low in carbohydrates. Scrambled eggs and bacon are keto. Steak with a side of broccoli is keto. Virtually any combination of meat (salmon, shrimp, turkey, ground beef, chicken thighs, and pork) seared in a pan with a bit of salt and pepper for seasoning, then paired with a low-carb green vegetable like kale, broccoli, or brussels sprouts is an easy keto dinner anyone can whip up on the spot. Approach this tip with caution, as many products advertised as a keto food are actually not keto-friendly at all. After all, how many times have you grabbed a store-bought product with “keto” written on the label, only to find out it contains 15-plus grams of carbohydrates? For an easy keto dinner that will never fail your carb count, keep Kettle & Fire soups on your shopping list. New flavors coming soon like Spicy Cauliflower, Butter Curry, and Broccoli Cheddar fit perfectly into your low-carb lifestyle. If you read the above tips only to think, “That’s great! But I still need a bit more guidance,” you’re in luck. Below, find eight low-carb recipes that even the laziest home chef can prepare. Have you ever noticed that spaghetti squash tastes remarkably similar to hashbrowns? This easy cheeseburger casserole loses the bun and side of fries but keeps all the flavors of your favorite juicy burger. If you think lasagna sounds a bit more complicated than what you signed up for, don’t let your eyes glaze over just yet. This recipe is incredibly — shockingly — simple to prepare, much more so than traditional lasagna. Cheese, ground beef, and Italian marinara sauce are mixed together in a single cast iron skillet for a bubbly, gooey lasagna that tastes just as good as the original. This easy Greek salad can be topped with grilled chicken, steak, or shrimp for a complete, low-carb meal. Feta cheese, cucumbers, and tomatoes and drenched in a delicious, sugar-free dressing that is both light and refreshing. Listen, if you’re ever pressed for time, remember this: Breakfast for dinner is one of the fastest meals you can make. This chorizo omelet might look fancy on the outside, but at the end of the day, it’s still an omelet. With practically no prep time and just a few minutes in a skillet, this is one meal that goes from prep to plate in less than 15 minutes. Remember earlier when we suggested meal prepping taco meat at the beginning of the week? Seasoned ground beef, avocado, grape tomatoes, and cheddar cheese are tossed together into this quick and easy taco salad you can enjoy any night of the week. A bunless burger is the right way to go when you’re at a total loss of ideas for dinner. In this butter burger recipe, butter is mixed right in with the ground beef, then topped with grilled veggies. Pair with your favorite low-carb veggies for a complete keto meal. Egg salad, tuna salad, and keto chicken salad are all quick, easy dinner ideas that can be rolled into a lettuce wrap and served within five minutes. However, you’ll have to double-check each ingredient you use, being wary of added sugar. In this egg salad recipe, mashed avocado is used in lieu of the typical mayo, adding a dose of healthy fats while decreasing the number of carbs. If you think a homemade keto pizza crust sounds like more work than it’s worth, you have another thing coming. This keto pizza could not be easier to assemble, using cream cheese, almond flour, and eggs to make a low-carb, high-fat crust. Prep your crust at the beginning of the week, then simply top with your favorite tomato sauce and pizza toppings for a lazy weeknight meal. For the nights where you rush home late from work or you just don’t feel like cooking, preparation is key. Having a few menu items already ready to go in your fridge (or cupboard) will take the stress out of a weeknight dinner. Kettle & Fire pre-packaged soups, like Miso Soup With Chicken Bone Broth, are the lazy person’s dream dinner. They are low in net carbs, free of unwanted ingredients, are come ready to eat. Just heat up on the stovetop or in the microwave and serve. What Is the Keto Flu and How Do You Cure it? Considering going Keto? 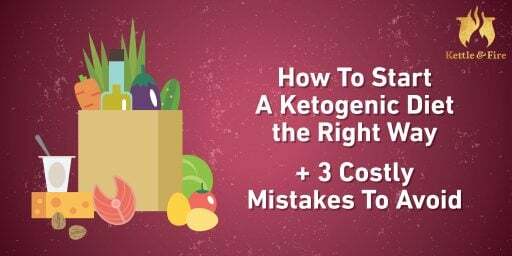 Here’s everything you need to know about following the keto diet, what to expect when you’re in ketosis, and how to maximize your results.